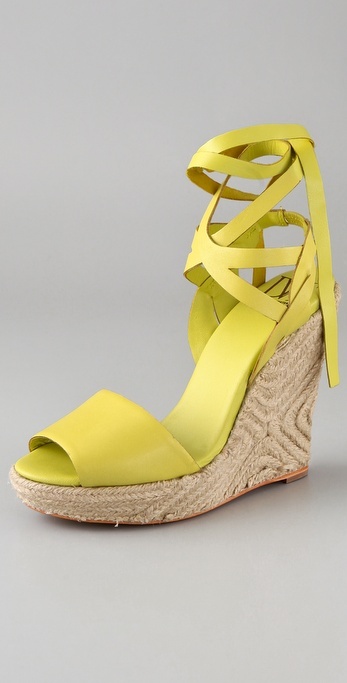 Today's So Shoe Me is the Pandora Wedge Espadrilles by Diane von Furstenberg, $255, available at ShopBop. Mixing two of this summer's biggest trends, espadrilles and brights, this wraparound wedge sandal is the perfect pick for an everyday shoe. The neon citron leather upper will mix well with neutrals as well as other brights leaving you no doubt that you look fresh and on trend, rather than garish and off beat. Pair these bright hued sandals with a coral maxi dress this summer for a mix of modern and casual styles. So Shoe Me a pair of fashionable neon espadrilles that bring modern style with casual finishes to my summer wardrobe.